Every year the commercial fishing boats sit idle in the harbour of Conche in Newfoundland, Canada as pack ice has moved in and they wait for the melting process which can take a few months. The fishing boats are loaded up with their crab pots and fishing gear in preparation for the earliest opportunity that they are able to leave the harbor. 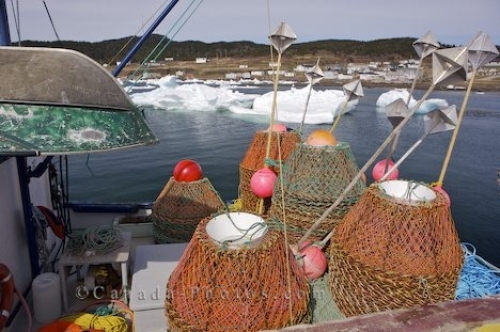 Picture of crab pots aboard a commercial fishing vessel that is docked in Conche Harbour in Newfoundland due to pack ice.